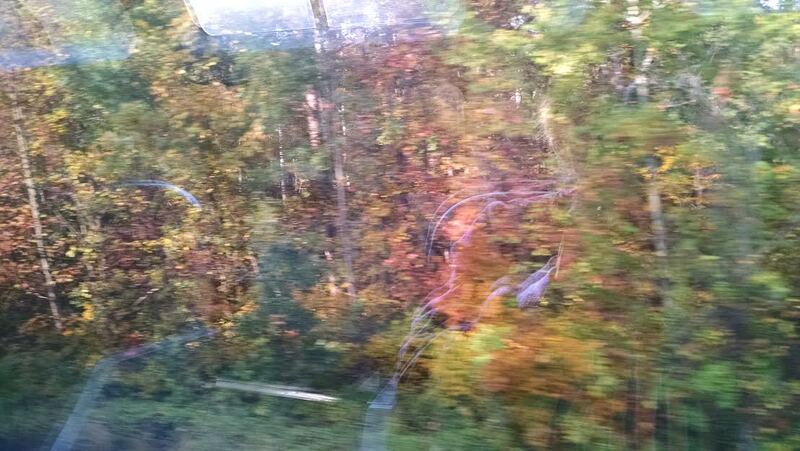 West Virginia color from an Amtrak train window. These have been busy, glorious, late September and October days, with no time to blog amid celebrating our oldest grandchild’s second birthday, visiting my 91-year-old mother (tied to a business trip), participation in the intense work of finding a new pastor for our church, and much more. 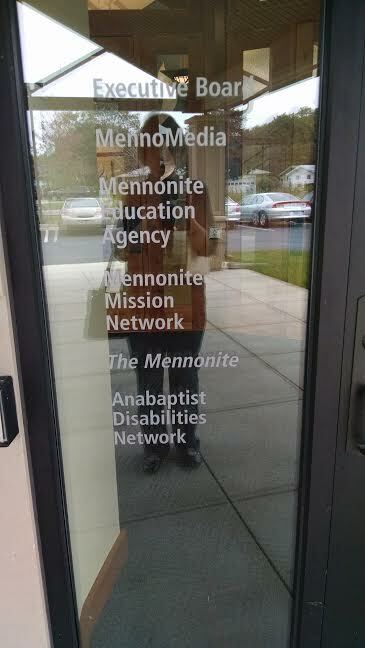 I had considered declaring a blog sabbatical or vacation or something, but I’m back. I like having this blog/journal because I like to remember things and too often, things that are not written down do get forgotten, reshaped, or remembered differently by diverse people. Do you believe when things are forgotten, it’s like they didn’t happen? Increasingly, I find myself the oldest—or among the oldest in a group. In a meeting, I hang out with younger people who don’t know names of well-known—to me—people of the church, community, or organization. And then I think, oh, they were just babies when that icon was a leader in the church. Or consider that most teenagers today have no personal memory of events like September 11, 2001, whereas for many of us, it was a pivotal moment in our personal and national/international history. Inside, I am still 24 (my age when I got married). Outside, my face and arms have wrinkles, and you don’t even want to know about my thighs. I can’t bear to share a close up selfie of my face. I look at my mother’s frail frame which was once strong and robust. I encourage her to not let her weight fall below a certain number, figuring I’ll probably be as frail and light as her someday too, if I last that long. 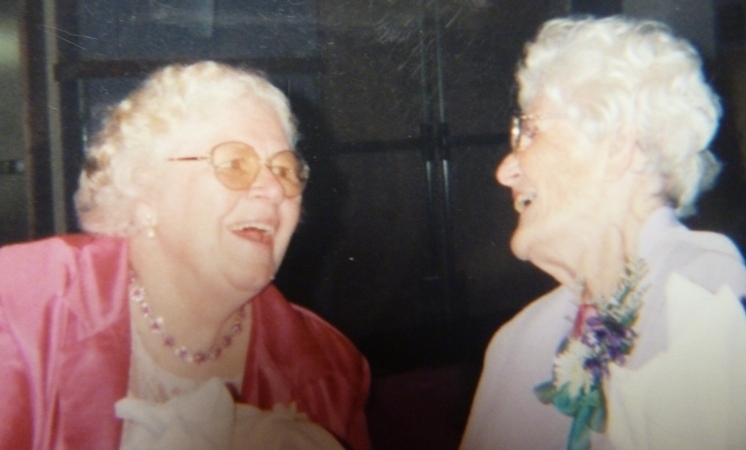 Dear friend Martha, left, in earlier days, with Mom. 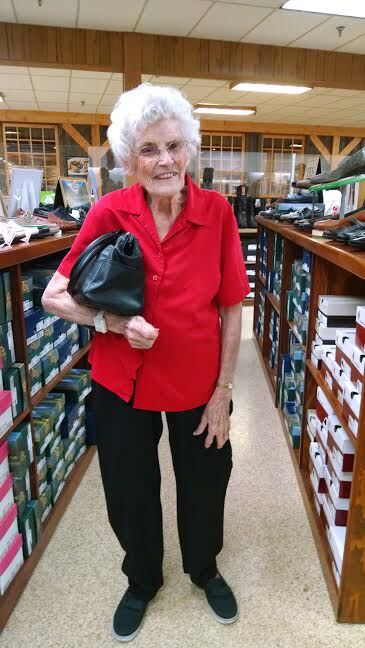 Is it lucky to live to be in your 90s? Mom says, “I’m afraid I’ll live to be one hundred.” Somehow that no longer seems like the grand milestone everyone aims for, when friends, family and even younger loved ones have already passed to the great beyond. I hope she sticks around until 100 and more if she is healthy. But not being able to hear—and having maxed out the capabilities of hearing aids—is no fun either. 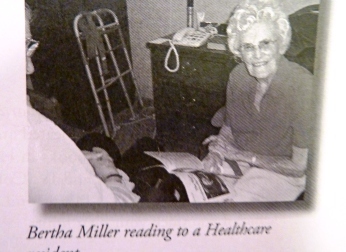 Reading for those who can no longer read for themselves in her retirement complex. 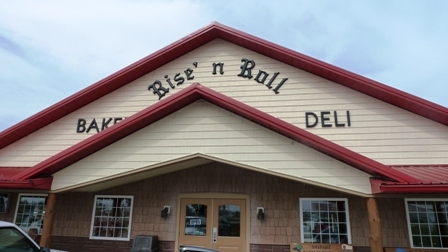 Popping in to a favorite bakery/deli near my hometown of Middlebury, Rise’ n Roll, for another round of those famous cinnamon and carmel donut holes, which I first fell in love with and wrote about here. 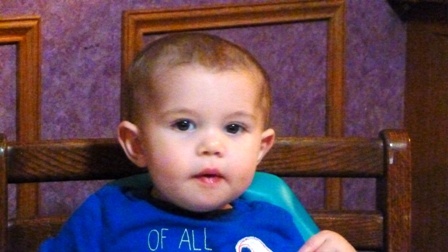 Great nephew Eli, who just celebrated his first birthday. 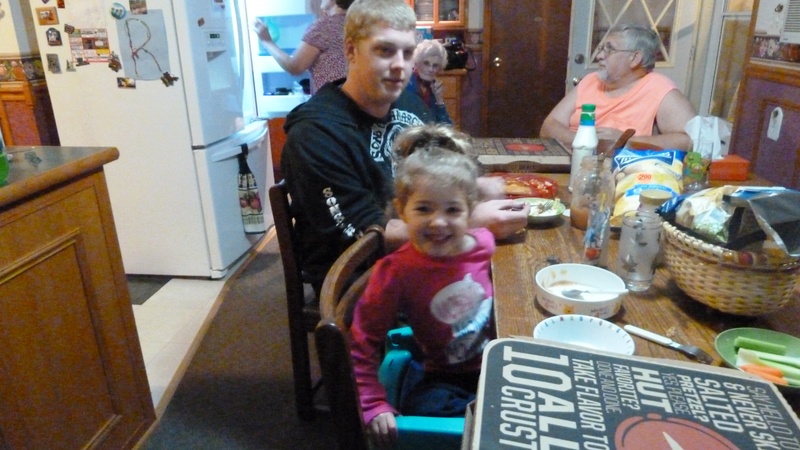 Nephew Christopher, great niece Lucy, and more. Pizza night with several members of my extended family. Yes, Mother got her Mountain Dew and Pizza Hut pizza. 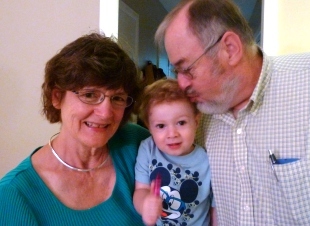 And I got to meet new great nephew Eli, about a year younger than my grandsons. 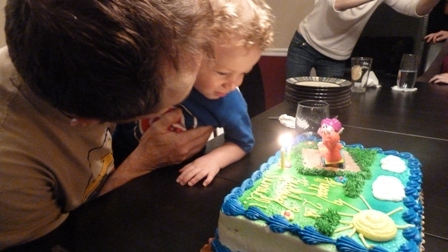 For me personally, the highlight of these recent autumn days and weeks was hearing both grandsons finally saying the beautiful words every grandparent longs to hear: Grandpa! Grandma! Grammy! I will remember these days and savor all the sweetness—far sweeter than the momentary high of those marvelous but addictive doughnut holes. Yoder’s Department Store, Shipshewana, Ind. 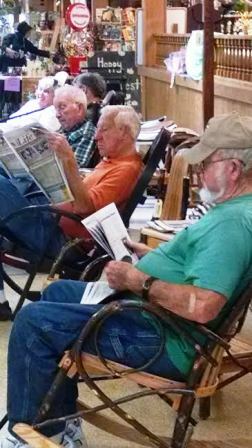 : Where people really do still sit in chairs outside of stores and read, rock, and remember. Is it lucky to live to be in your 90s? You can also sign up for my weekly Another Way newspaper column, appearing each Friday on ThirdWay.com/aw, or let me know if there is a newspaper near you which may be interested in using the column. Thanks! I don’t know about the saying “When things are forgotten, it’s like they didn’t happen.” Maybe yes, maybe no. If someone finds a piece of memorabilia like an object or newspaper clipping, that thing can snap back to life. Like me, you have a busy, busy life and scarcely have time to enjoy it. But you have a summary here and can savor it in retrospect someday. No one would blame you for taking a hiatus, Melodie. The nudges that spring memories back to life are great to ponder–and welcome. That certainly happens. And about the hiatus: I wasn’t really apologizing, just ‘splaining. 🙂 In truth, we all are snowed with so much material to read–that we like to keep up with–that it is kind of nice when readers can take a hiatus, too! My life is a spiral of forgetting and remembering. Forgetting can allow things to be re-experienced in a new way. E.g. do I ever think about Yoder’s? No, but your description of your mother in Yoder’s brings back memories! And even things you never remember shape your life. Oh, I think I could write a whole post about this. Better stop here! I don’t know you Ms. Myers (Nancy?) but I’ve checked out your website. A practical mystic – hmmm! You might appreciate this then! Marian, thanks for this, too! I’m trying to think who my prof was when we studied this poem, and how much I liked it. Thanks for bringing it back here–English teacher that you are. Oh yes Marian. It has been so long since I’ve read that poem. I was young then. I thought it was a nice image. Now I know it is true. Melodie, I can go with you on your adventures to all these places, and I know most of the people that the younguns have no memory of. One of our roles at this stage of life is to be carriers of memories others know not of. As someone who thinks about both memory and history a lot, I’m not sure I agree that forgetting is a complete erasure. Any trace of journals, letters, interviews, images, or material culture can be enough for a clever detective to resurrect memory sometime in the future. But it’s also true that we sometimes select our memories in harmful ways. Those that deliberately try to blot out history (Holocaust deniers) or mythmakers like Parson Weems (Washington and the cherry tree story) prove that memory, like truth itself, can lose in the short run, but usually it wins in the long run. On my Amtrak ride I met another couple at breakfast who had a month long pass for riding the rails–and I actually mentioned you and your trip–was that just last year? They were having a grand time.